Founded in South Africa in the 1970s, ChlorKing® has become a worldwide innovator in on-site chlorine generation. We make commercial pools and water treatment facilities safer and more cost-effective by eliminating the need to store and handle bulk chlorine in liquid or granular form, and we lower operating costs – all by replacing chlorine with less expensive salt. Our patented technology uses pool water to generate chlorine, reducing fresh-water requirements and reducing TDS through a lower ratio of salt to chlorine produced. This enables pool owners to inject muriatic acid into the production tank to lower pH to 7.5 while cutting muriatic acid use in half. Our patented technology also produces large amounts of chlorine in a single cell instead of banking multiple small cells together. Our systems were initially designed and developed by our founder, David S. von Broembsen, a chemical engineer, for large-scale water treatment applications in South Africa. In 1999, he partnered with fellow South African Steve Pearce to launch ChlorKing® Inc. U.S.A., and they moved manufacturing and distribution to Atlanta, GA. This enabled them to take advantage of the untapped U.S commercial swimming pool market, where on-site chlorine generation and salt chlorination were starting to make gains against traditional granular or liquid chlorine to sanitize water. In 2009 ChlorKing® launched its NEXGEN line of chlorine generators, and in 2009, they acquired Sentry UV to offer ultraviolet light technology as a cost-effective, low-maintenance complement to their primary disinfection technology for commercial swimming pools and spas that are NSF/ANSI-50 certified. Today, ChlorKing has more than 12,000 commercial swimming pool and water park installations worldwide. 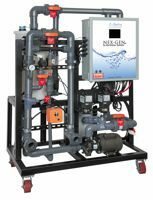 Whether your concern is water use or TDS levels, ChlorKing’s NEXGEN newest onsite chlorine generation systems help manage both through a patented technology that uses pool water to generate chlorine. Less water is required to produce sufficient chlorine for disinfection, and the ratio of salt to pounds of chlorine produced is lower. You can inject muriatic acid into the production tank to lower pH to 7.5 and cut muriatic acid usage in half. Systems produce 10 to 120lbs per day.